Fire Fighters Charity calls on public to 'Bake a Difference'! 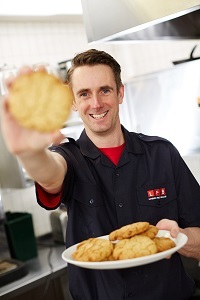 This May The Fire Fighters Charity is holding its first ever national Bake a Difference event! Looking to encourage supporters across the UK to ditch the diet in favour of doughnut for a day, the Charity is hoping that the nation will dig deep and bake hard to show their support for the everyday heroes who risk their lives to save us from life-threatening situations. The Fire Fighters Charity, which offers life enhancing support services to injured firefighters and last year provided rehabilitation support to 2,345 beneficiaries, has joined forces with star of The Great British Bake Off and East Greenwich firefighter Mat Riley, to encourage fellow firefighters, friends, family and members of the public to put on a bake sale this May. "Baking is such a rewarding thing, especially if you're holding a bake sale and raising money," explained Mat. "Supporting the Charity is massively important and this is a great way to do it. We'll be holding a bake sale at East Greenwich, so it would be great to see other stations, offices, schools, libraries, community centres and all kinds of other places showing off their baking skills and raising some money too." So wherever you are, and whatever level your baking talent, The Fire Fighters Charity is calling on the country to come together - on or around World Baking Day on May 17th - for a slice of cake and a cup of tea, and to help change more lives in the process. The Charity has prepared everything to help bake sales run smoothly including Bake a Difference posters, cake labels and cake signage. These are all available from www.firefighterscharity.org.uk/bakeadifference along with some top tips on holding a successful bake sale and how to pay in any money raised. Win our Bake a Difference Competition! The bake sale that raises the most money will win The Fire Fighters Charity coveted Golden Rolling Pin trophy and a huge hamper of chocolate. Closing date for entries is Friday 10th of June 2016.